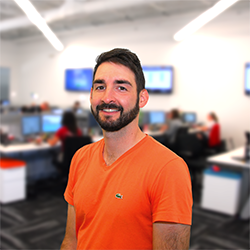 This week we're showcasing Marketing Coordinator, Jeff Schneider. Jeff lives in Lincoln, and has been working at Mortech for four years. Favorite things to do on his days off: I’m a huge live music fan, so I go to a lot of concerts. Favorite place to travel: Colorado in the winter. You can’t beat the sunshine, fresh air, and slopes. Favorite time of the year: Every part of the year has its perks. Usually, by the time each season ends, I’m ready for the next one to start. Favorite thing about working at Mortech/Zillow: The people. Favorite feature of Marksman: The flexibility. Our system is beneficial to such a wide range of company sizes and employees within those organizations. Marksman Insider Tip: Take advantage of our knowledgeable customer support staff and monthly training sessions. If you don’t know about a feature or process, don’t be afraid to ask. Last week we showcased Graphic Designer Austin Lehr, which you can find here. Or to learn more about Marksman, you can click here.